Fun! In Oakville we have the same idea but with moose and a few wolves. What a peaceful scene to encounter in that huge city! 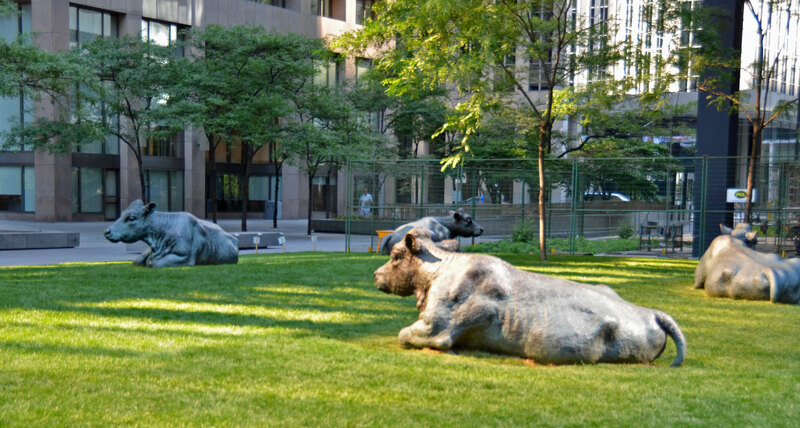 Here in Hartford we have a bunch of boulders “artfully arranged” in what is called “Stone Field ” these cows look so much better. The cows do give a feeling of separation from the city. The boulders could be very serene! They may have a chance in the near future. Right now, they are strewn on a narrow strip of land that very few people ever walk by. The city is planning to move the road a bit to the south, to make the field with the stones larger. I’m not sure if they plan to move the stones or contact the artist who arranged them. I forgot to mention that behind the stones, is an old church and a historic cemetery. these are so cool! and unique, thanks for sharing. Very unique. I can imagine walking by that park and doing a double take. I haven’t been to Toronto that often and never saw these! Thanks for sharing, Brett. Toronto has a lot of public art. I have a few other posts planned to highlight some more of this. Bring back some form of farm life before Industrialization ruined that or for some people thrived off of that. Cool shots. Thanks. In many ways people seem to better appreciate farming now. Nice and calming. Surely the grass does not look like that now? I will try to feel sad for you while I mow for the SECOND time this week. Surely you will see it in the next couple of months! Yes, they stay put good! Well-placed! Happy spring to you, as well! Really enjoyed the photographs and the story. Thank you. I will be travelling next year 2016 in June to Toronto to celebrate the 65th birthday there and than travel onwards to family in London, Ontario together with daughter and grandson. This is something to experience and enjoy. All the best in your journeys and adventures. Public art is a very important feature of a well-planned public urban space. I like how imposing yet restful these bovines are. Remember the funny painted moose that were all over the city a few a years ago? I happened to spot the same idea in Shanghai a few weeks ago. I will have to post them. A nice surprise for anyone coming around the corner! The sculptures are really quite beautiful. They bring some serenity to that little corner of the busy city. Snow-draped sculptures can be quite the sight! That must explain the metallic taste to the milk in my coffee this morning….. 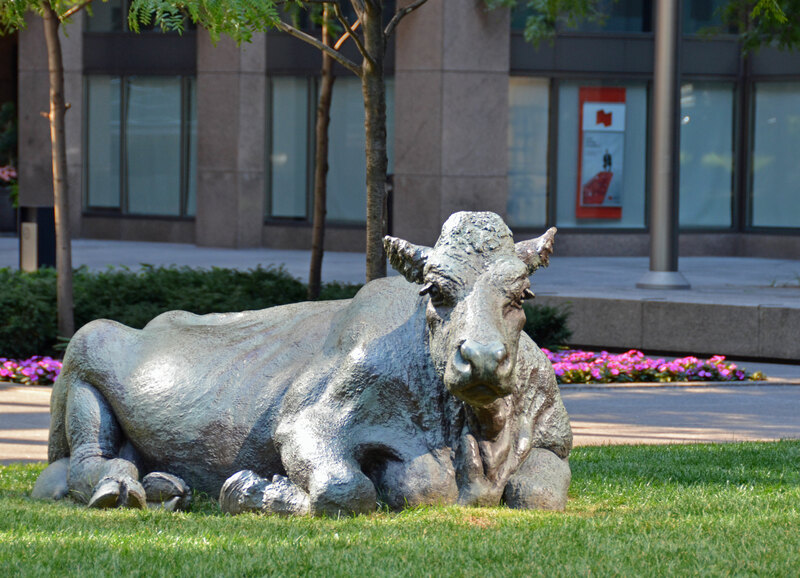 Cows do well in poetry but less well in sculpture. These are an exception. 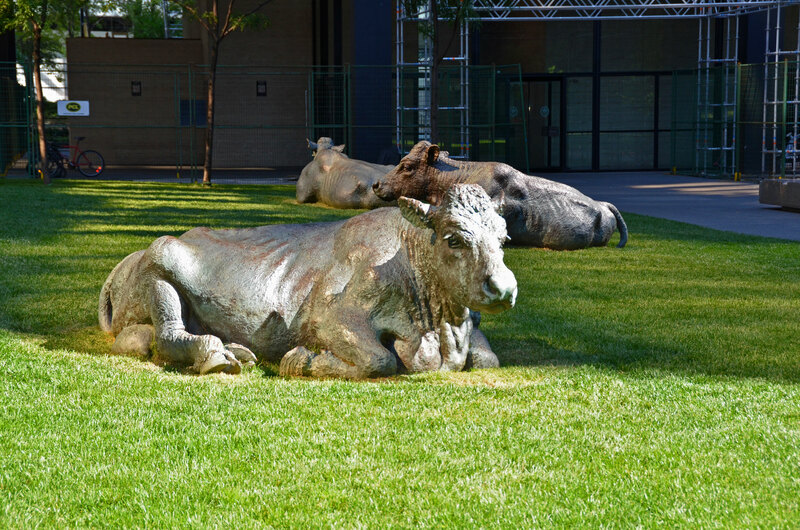 Here in England we have some (awful) famous concrete cows in Milton Keynes. Your Canadian cows win by a country mile. A “country mile” is a fitting way of expressing that! I haven’t heard of Joe Fafard, I ought to google him out. Love the sculptures!!!!! Love the photographs!!!!! If you like these ones, head to Regina. Fafard is Saskatchewan born and his art is all over the city. In Seattle, in and around Pike’s Place Market, there are bronze pigs.